Holy cow. The Android version name rumor-mill has been cranking at full steam for the last couple of months, and everyone seems pretty well-convinced that Jelly Bean is the chosen title for Google's next iteration of the mobile operating system. Way back in September, The Verge suggested that a "reliable source" had told them Jelly Bean was the real McCoy. Let's talk about what we know about Google's naming strategy so far with Android, and why anything but Jelly Bean would make almost no sense. First, what names have there been? Cupcake, Donut, Eclair, Froyo, Gingerbread, Honeycomb, and Ice Cream Sandwich. One thing all these names have in common is that they are generic. This immediately kills off two major possibilities for the "J" version of Android - Jell-O and Jujube - both of which are copyrighted product names. So they're off the table. Aside from jelly roll or jawbreaker, there aren't many other "J" desserts. Jelly roll, let's be honest, sounds kind of weird anyway. There's also the fact that the last four versions of Android, Froyo, Gingerbread, Honeycomb, and ICS, are not pastries. So, it seems very possible that Google is moving away from that theme. What about jawbreaker? Maybe, but given that Google was actually handing out jelly beans at MWC in Barcelona last week, we're not holding out on that one, either. Jelly bean, then, is the most obvious choice, and given how long we've gone without rumors of an alternative name, I'm pretty confident in it. 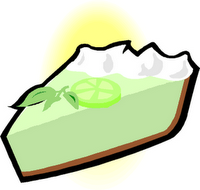 Then The Verge just had to go and talk to their "reliable source" again, and came up with Key Lime Pie as the successor to Jelly Bean. Now, think of any other desserts or sweets in common use in the USA that start with K. No proprietary product names, and no weird spellings. There really just isn't anything else. If it's not Key Lime Pie, I'll film myself smashing such a pie against my face. On YouTube. You can take that to the bank. I really think it's that obvious. Next, version numbers. The way Android version numbers work is basically this: the version number you see on a release build of Android is not decided until very late in the development process. Internally, Google doesn't use the version numbers we see. They use build numbers (eg, ITL41F for the VZW Galaxy Nexus) and other systems that I don't claim to know or remotely understand the logic of. Basically, the next version of Android could be 5.0. It could be 4.5. It could be 4.1. We don't know. One thing we do know is that some VP at ASUS isn't on the Android development team.